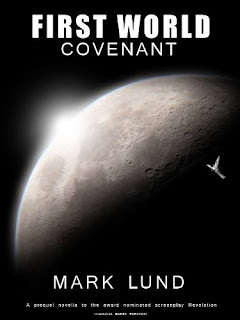 Mark Lund, First World: Covenant. The Ashton Times, 2011. ISBN 9780615491752. $0.99 Kindle. Mark Lund’s 2011 novella, First World: Covenant, explores the Moon landing conspiracy theory, but not the one we might expect. China’s unexpected announcement in 2018 that it is launching a manned mission to the Moon sets in motion a clash of competing secret world organizations. One is an alien presence that has permeated Earth’s governments and global economy. The other has been poised for decades to prevent further manned lunar missions in order to guard a secret that would shatter the realities of all of Earth’s inhabitants. The story engages a number of current issues: the end of NASA’s Shuttle program, China’s growing power, our diminishing trust in government, and even the US debt woes. The thread woven in First World reaches back to the Apollo space program (and really even further still) and implicates past US Presidents and other world leaders. Its basis is audacious and inventive. First World has a plethora of appealing themes for the reader to consume. The battle of clandestine world orders is intertwined with alien infiltration, Watergate, and secrets passed down from one world leader to the next. Mark Lund walks that thin line that is every conspiracy story’s challenge. On the one hand, given its magnitude, it is realistic that the cover-up would be tied to many world leaders, powers and historic events. On the other, the key to a plausible conspiracy story is to avoid entering Forrest Gump territory and linking the characters and plot to absolutely every significant event in the last forty years. First World walks this line successfully by keeping the correlations relevant to the lie the public has been told. An important aspect of science fiction is pushing the limits of innovative and plausible technology. It’s admittedly unfair to expect mind-blowing new tech from a story set only seven years in the future. Nevertheless, First World offers up a few tantalizing nuggets such as a second generation anti-gravity space shuttle and implanted communication devices. I read these descriptions with great interest but in some cases Lund reaches a bit too far in an attempt to relate these devices to today’s known technology. The mention of a “Bluetooth successor”, for example, grabs me by the collar and shakes me out of that all important suspension of disbelief. Lund expertly describes the technology, and in my view such references are unnecessary and detract from the story. As a reader, First World did leave me with some wants, a few of which are inextricably linked to the conspiracy theory paradigm. Lund’s story is very plot driven and a lot happens. However, the answers to many of my questions have apparently been left to the sequel. Tantalizing the reader into picking up the sequel is an art and it is easy to over-promise and under-deliver in a first book of a series. Although it’s more than desirable to leave us wanting more, an opening book should be a complete story arc unto itself. I think First World could have given up a few more secrets and still kept me salivating for the next volume. Most sections and chapters end with a cliffhanging question. That technique could have been used more judiciously. It’s telling that former President Richard Nixon plays a significant role in a story built on a web of lies. In Ranking and Evaluating Presidents: The Case of Theodore Roosevelt, presidential biographer and Pulitzer Prize winner James MacGregor Burns aptly describes Nixon by saying, “How can one evaluate such an idiosyncratic President, so brilliant and so morally lacking?” It’s perhaps even more telling that Nixon’s legacy and the epitome of clandestine illegal activity, the Watergate scandal, is footnoted as a necessary evil in First World’s schemes. Is Lund arguing that certain truths are best withheld from the public for our own good? Can leaders who face complex political and economic realities in an age where the public expects full and immediate access to information justify deception for the greater good? Are they not simply protecting the unwashed masses from themselves? Unfortunately, without some of the answers to the many questions that this first book raises, it is difficult discern whether First World is offering any such comment. If it is, there is definitely an opportunity in the sequel to flesh out that premise. If it is not, it might be a missed occasion that could still be seized. A lot of the information we receive is by way of exposition of past events. I find factual revelation through the actions of characters more engaging. This also allows us to relate to the cast at the same time. And there are a lot of characters. There were a few spots where I had to flip back to remember where this particular government or military official fit in. This might have been because I read it over several sittings, but I was in the weeds a bit. The protagonist, however, Kathleen Gould, is absolutely memorable and interesting. Our introduction to Gould in her kitchen having coffee is very benign and every-day. This contrasts vividly to her fundamental impact on world history and direction. The scenes involving her are the most appealing. A novella is not long and there is always the temptation on the part of the author to get on with the plot too quickly and therefore miss opportunities to use engaging stick-to-your-bones language. While there are several memorable and clever turns of phrase in First World, and Lund clearly has that capacity, I wanted to see more of such flourishes. There was also an occasional frustrating mix of points of view in the same scenes. This is particularly jarring in a conspiracy theory when knowledge of a secret by one character is very much what separates her from another character who is blissfully ignorant. Being in both heads renders the scene harder to swallow. Overall, First World is an exciting take on the Moon landing conspirary genre and I would pick up the sequel, First World: Synedrion, due out in the fall of this year. However, I hope to see a tightening of the points of view, an increased confidence in the use of bold turns of phrase and a cutback in ever-escalating cliffhangers. A nod is warranted to illustrator Marek Purzycki and his beautiful artwork that accompanies First World.